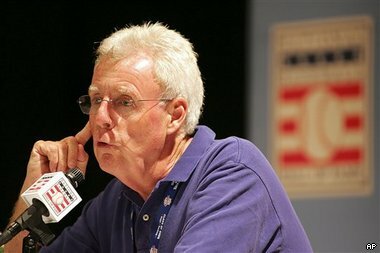 ESPN baseball guru Peter Gammons found today that he has a brain aneurysm. He had surgury today as well in Boston. He is expected to be in intensive care for 2 weeks. Gammons is one of the best covering baseball. I could listen to him talk about the game all day. He is great on baseball tonight also. If you asked me the top three guys who cover baseball today Id have to say Gammons, Kurkjian (sorry about my spelling ) and Verducci . We hope Mr Gammons returns to better health soon. Dont look now but the Twins are going on a nice run. Winning 9 of there last 10 games. They are really tough to beat at home in the dome. Led by there ace pitcher Santana who has turned things around nicely since his early season troubles. Santana is probably the best pitcher in the AL , maybee all of baseball. Too bad the Twins are too far back to contend for the division. With both Detroit and Chicago playing just as good, the central will go to one of them. Minnesota can make a run at the wide open wildcard and keep there fingers crossed. With the Tigers,Sox,Blue Jays,Yankees and Red Sox all fighting for 3 spots , its going to be an uphill battle for the Twins to be anything other than spoilers. Albert Pujols and Derrek Lee are both back off the DL. For Pujols , it may take him another week or so to get back into the groove. He should really help St Louis right the ship. The Card's have been trying to stay above water without Pujols and have just managed to hang on over that time. As for Lee , he was rehabing in the minors but with all the Cubs injuries they decided to call him up a few days early. Mostly due to being in AL parks with a DH in use. Lee will DH for the Cubs as his wrist gets back into shape. I kind think Lee will take the rest of the season to get his swing back. The Cubs are not going anywhere with or without him this year so he has time to rehab in the majors. 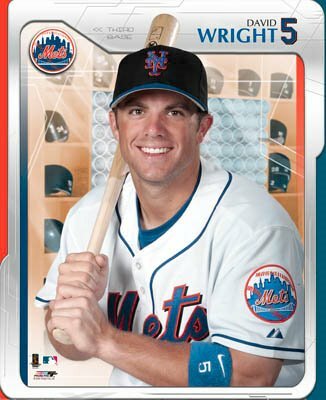 Mets 3rd baseman David Wright is on fire. He hit another bomb again tonight. This time adding another 3 more rbi's to the back of his card. In this last 11 games he has 7 homers and 19 rbi's. Last night you could hear chants of M-V-P from the fans at Shea. Wright is only 23 so I dont want to get too far ahead of myself but the Mets have a great hitting young superstar over at 3rd. With Wright and Jose Reyes (the other young up and coming superstar) the Mets have a solid foundation that is now surrounded by tons of veterans. Last year the White Sox walked away with it and never looked back. I dont want to jinx NY but it looks like the Mets will get plenty of rest going into the playoffs. While the Yankees have ruled NY for over 10 years , New York is still a national league town at heart. Longtime Brave's pitcher John Schmoltz is coming to terms with his teams worst season in probably 15 years. The Braves are done and going deeper into the basement of the NL East. Rumors have been flying about Schmoltz and Hudson being on the trading block. They way the Braves have been downsizing the last few years I wouldnt be suprised if both of these guys get traded. This week Schmoltz came out and said he is ok if he is traded. I doubt the Braves would ever trade in there own division so looks like the Mets are out of the running here. Look for the Yankees, Red Sox and Dodgers to try to come up with a package trying to make a deal. MLB suspended Randy Johnson for 5 games (1 start) for pitching inside to a Cleveland batter. Yes thats right suspended for pitching inside , there was no hit batter and no base on balls. While both teams were warned when Yankees catcher Posada was hit by a pitch , this is another example of how bad the beanball rules are in baseball today. Johnson is the only Yankee with the balls to stand up for the team. They should have hit Ortiz a long time ago. Let the pitchers have control of the game once again. This is a joke that Johnson sits for not actually hitting a batter. I wouldnt be surprised if this one dismissed and Randy is let go with a fine only. Im no fan of this rat Gimsley. The guy named names and sold out friends. I know steriods are a problem in the game. However the rat got the same suspension as if he actually tested positive and it was labeled under the steriod policy. Now Grimsley did the roids , he admitted it , but he never failed a test. This is a tricky question and will probably go without any notice. You would think the player union would not go for this. Well they know its a fight they could never win in the court of public opinion. It is a fight they will bring up when the next players-owners agreement comes up. Personaly, Im ok with the length of the suspension , but it should not be labeled with the people who have actually tested positive. Using the Grimsley logic , shouldnt players like Bonds, Giambi, and Sheffield who have admitted to using steriods be suspended for 50 games? All three have admitted taking steriods even if they did so unknowingly. MLB has a long way to go on this. Personaly I think the best way to go is to set policy , enforce it and move forward. Dont try to change things as you go because of the circumstances that come to pass. Last night in the White Sox game , Ozzie the manager ordered rookie pitcher Tracy to hit a Texas batter - Hank Blalock. Retaliation for a hit batter by Rangers pitcher Padilla. Tracy did try but did not hit the batter. He was pulled from the game and the manager went crazy. Screaming at the kid for not doing as he was told. While I agree a pitcher should hit a batter if the manager says so , this kid is a rookie. Probably nervous just being out there. Im sure most of his teammates will say he tried. I think Ozzie Guillen went overboard here. He's just a hot head anyway. Im no Yankee fan , but Joe Torre(most agree the top manager) probably would have talked to him in private instead of in front of the team and everyone watching on tv. The 'rules' now about warning teams and ejecting pitchers for hitting a player or even for throwing inside (Johnson suspended 5 games) are dumb. Maybee Im old school but these players crowd the plate big time and even wear this battle armor on there elbows and ankles. Its a better game when pitchers , instead of hitters, run the show. Tracy was sent down to AAA today. The White Sox say it due to performance , everyone knows its for being a scared kid. Guillen's act will get old real fast as soon as the Sox dont make the playoffs. Wrigley Field is the great old ballpark that the Cubs play in. When I was a kid all games at Wrigley were day games. They didnt even have lights there. In the early 80's , the league made Chicago gets the lights. I think back then the league said if you didnt have lights you would not be able to play in the playoffs. Wrigley Field was the last field in MLB to instal lights. Now the Cubs and Wrigley will be the first team to use wireless phones. Son the next time one of those Cubbie pitchers bombs and Dusty has to call to the penn to start warming guys up , he will be doing so on a new stlye wireless handset. I figure in about 2 years every team will be wireless. Looks like Dodger reliever Eric Gagne is headed back to the DL. His elbow has more pain. Its too bad about Gagne as his career is in jepordy at this point. Some will say the Dodgers rushed him back too soon last year and he reinjured his elbow. Looks like he still has a long way to go to recover.If you ask me, he should take 2 full years off and then see if he can come back. Look for Baez to close the rest of the games this year. Today the Mets finally parted ways with Kaz Matsui. He came over to the Mets from Japan and brought a high price tag with him. However he never produced. Even Bobby Valentine (a good judge of Japanese tallent) thought Matsui would be one of the best players to come over. Everyone was wrong on this one. I think the Mets were about to let him go anyway so at least they got a veteran bench player in return, Eli Marrero. Matsui was never liked by the NY fans , mostly because of his poor play at SS and 2nd. You wont find a single person at Shea who is sad Kaz is gone. Yesterday , Feds raided Arizona Diamondbacks pitcher Jason Grimsley's home looking for steroids. They found a whole seasons worth of the stuff. Not the stuff you can detect with the new drug policy in MLB , the stuff that is only detected by blood test. MLB only tests urine, not blood. Grimsley was released by Arizona and is probably done pitching in the league. While Im all for the testing MLB does , I must say Grimsley is a RAT. He went on to tell Feds about other players. He named names including former teammates and someone called one of his "better friends in baseball". Many people will say 'if you play with fire, you might get burned' , but still, I cant get over how fast Grimsley implicated others , friends. I guess as long as there are ways to try and cheat to get ahead , people will try them. Im just sick of the whole roid era (or end of it now). Ive said it before and I will say it again, MLB has a policy. Im glad they do. Let move forward ,enforce it and just enjoy the game. Today the Card's put firstbasemen Albert Pujols on the 15 day DL with a muscle strain. These injuries are tricky and sometime are different from person to person. He could be out as long as 6 weeks. Lets hope the slugger gets back in shape soon. The Card's will try to hold there lead in the NL Central while he's out. 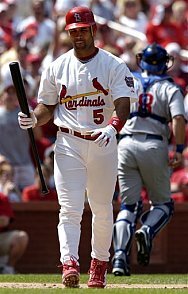 Even if they play 500 ball while Pujols is out, I think St Louis will still end up on top of things in the central come september. Without a healthy Pujols in October , the Card's will be ripe for the picking ! East- The Mets have a good team. They should be there in the end but with some problems in starting pitching it may not be so easy. Atlanta is not the same , but they are still the Braves until someone knocks them out for good. Atlanta's manager is one of the best in the game. Philly is a solid team but I dont think there pitching will hold up. They play in that bandbox and that doesnt help the pitchers either. Florida is done and DC is close to done. I like the Mets to take the division and finally end the Braves run. West - All the teams are over 500. However I think over the year the teams will beat up on each other and the division will probably go to whoever survives.. Arizona is solid and they may suprise everyone and take it. The Dodgers are solid but can there veterans stay healthy all year? Gagne,Garciaparra,Kent,Penny... to name a few , all could go injured at any time. San Diego is again playing good ball and should finish up around the same place as last year. But will 500 be enough to win this time - probably not. Colorodo has shown improvement. Maybee putting the balls into the cigar stlye humador before the games has helped keep the ball in the park. San Fran has struggled a little but has held on. Maybee this is the year they go south and rebuild. Let Bonds have his show this year then rebuild after hes gone next year. I like the Dodgers to hang in there until the end. Maybee there will be a nice race to win this division. Central - Once again its the Card's to loose. I doubt they will loose it either. While this is a competitive division, no one will catch St Louis. Cinnci has been good and I think they will have a good year (just not playoffs). Houstin is a question here. They kept at 500 and now Clemons will be back in a few weeks. Maybee they can go on a run like last year. For some reason I dont think it will happen this time. The Brewers are a good team but are still a year or two away from contending. Cubs are done and should rebuild. The Pirates are done too. Nothing worth saying about these two teams !